And lo and behold, Theo completes the streak. Hermida signed for one year and a little over $3.3 million. So that’s eight years without arbitration. A happy organization with happy players produces a good team, so you can chalk a lot of the guys’ satisfaction with the front office up to the fact that they haven’t been in a position where they have to defend themselves against their own team. Tickets went on sale yesterday! Which means that by now everything is probably sold out. But on the bright side, that means that pitchers and catchers is right around the corner! It’s been a long winter, but hang in there; not too much longer. There is, however, a dark shroud of depression hanging over Opening Day. Literally, that dark shroud is ESPN. Figuratively, it’s the actual darkness of night. Because guess what: since this year’s Opening Day at Fenway Park means the Yankees are coming to town, ESPN decided to make it Opening Night instead. That’s right. There will be no Opening Day in New England this year. No day-long holiday in Boston. No young kids running around taking it all in. No sunshine to illuminate the field or warm you up. No Don Orsillo and Jerry Remy. Instead, we’ve got a whole day before the game starts. We’ve got kids who have to stay home because it’s a school night. We’ve got lights. And we’ve got Joe Morgan. It’s incredible; the first game of the season hasn’t even started, and the Yankees have already ruined it. Don’t get me wrong, I love night games, but for Opening Day it just isn’t the same. Lastly, let’s get this whole Bay thing over with once and for all. Here’s the deal. Remember that offer we made after the All-Star break, a four-year deal worth sixty million? Bay initially rejected it but then changed his mind. But during the physical, the Red Sox didn’t like the look of Bay’s knees and shoulder, so they revised the deal: the third and fourth years would now depend on health and productivity, and Bay would have to have minor knee surgery in the offseason. Bay acquired a second opinion that stated that surgery wasn’t necessary. He and the Red Sox requested a third opinion, which yielded the same observation. The insurance company’s doctor also vouched for Bay’s durability. At the Winter Meetings, the Red Sox revised the deal again: they guaranteed the first three years but requested injury protection for the fourth year such that if Bay became injured because of pre-existing conditions identified by the club, they could void the fourth year. The Red Sox also asked Bay to pay a large part of his insurance policy. Bay refused, and we all know what happened after that. This sounds a lot more sinister than it actually is. First of all, the fact that Bay passed the Mets’ physical with flying colors doesn’t say much. This is the same team that signed Pedro Martinez to a long-term contract after Thomas Gill, team doctor for both the Red Sox and Patriots, specifically told the Red Sox front office not to do that because his breakdown was imminent. And lo and behold. 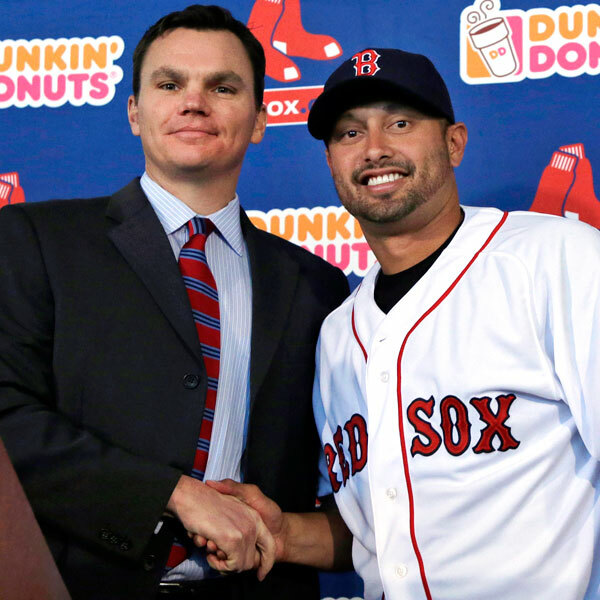 Secondly, what’s wrong with the Red Sox seeking protection for their investment? People are seizing on the fact that the Red Sox wanted Bay to have surgery on something that wasn’t bothering him, but after other opinions were produced, they revised that and simply asked for protection. That’s it. Gill insisted that such a protection be built into JD Drew’s contract, and Scott Boras agreed to it. Scott Boras agreed to it. If Scott Boras agreed to it, it must have been the world’s most just demand, because any team would be hard-pressed to get Scott Boras to agree to anything. Lackey also agreed to an injury protection clause. (His is a little different; if he ever has elbow surgery while under contract, the Sox can bring him back for a sixth year at Major League minimum wage.) And the Sox will probably build something like that into Beckett’s and Papelbon’s future contracts. Look, if we’re looking to pay Bay millions of dollars, I think we have a right to ensure that those millions of dollars won’t be a complete and total waste as soon as Bay steps or slides or falls the wrong way. The wear and tear alone is a cause for concern, and that’s yet another reason not to trust the Mets’ medical opinion. Bay passed their physical with flying colors on his way to play left at Citi Field? That’s like stepping into a time warp; playing left at Citi Field will break you down twice as fast. Besides, if Bay is so sure of his health, why didn’t he just take this most recent version of the deal and sign a new one when the time came? If he’d remained a specimen of health, the fourth year wouldn’t have been voided, and all would’ve been as per usual. So that seems kind of fishy to me. All we can do is wait to see if the Red Sox were right, but if in the future Bay does prove the Red Sox correct, rest assured that Red Sox Nation will most definitely be there to say, “We told you so.” Okay, maybe we won’t say it, but we will think it, and we will think it loudly. The Bruins are something I don’t even want to discuss. We are in dire straits right now. Dire straits. The Canes absolutely crushed us last weekend, and we lost to the Sabres on Friday and the Kings yesterday in overtime. We have fifty-five points, good for ninth in the Eastern Conference. The Thrashers and Habs both have fifty-six. If we don’t firmly cement ourselves into a playoff berth soon, the playoffs will quickly cease to be an option at all.